thesemomentsofmagic | Magic, the hand of God, synchronicity, destiny: no matter what you call it there are moments when it affects us all. These are some of my moments. Where our passion meets the world’s deep need. This is a project very near and dear to my heart. I am part of the team designing this project and heading to India to help empower communities to make choices to keep their daughters out of human trafficking. It just takes a few minutes to watch the video, but your support could make all the difference for the families we are fighting to help. In September of this year, four LEAPYEAR2 students, assisted by LEAPNOW staff, got together determined to use our hearts, minds and resources to be a positive change in the world. We decided to pool our time, energy and money to take on a significant project in the Spring of 2014. We asked the question “How can we best serve the world?” then contacted 70 organizations on 4 continents and asked them how they might use the efforts of a committed group of volunteers and our pooled financial resources for 2-3 months. About 18 service organizations responded with invitations to do a project. From these we chose to work with Guria in north India, because their project seemed the most engaging and potentially impactful. India is the most impossible, frustrating, overwhelming, beautiful, awe-inspiring, welcoming, surprising, and loving places I’ve ever been. Rest assured that I have a million and one posts I can and will write about India, but this particular memory is one that I can’t think about without bringing tears to my eyes. It had been a very long day. 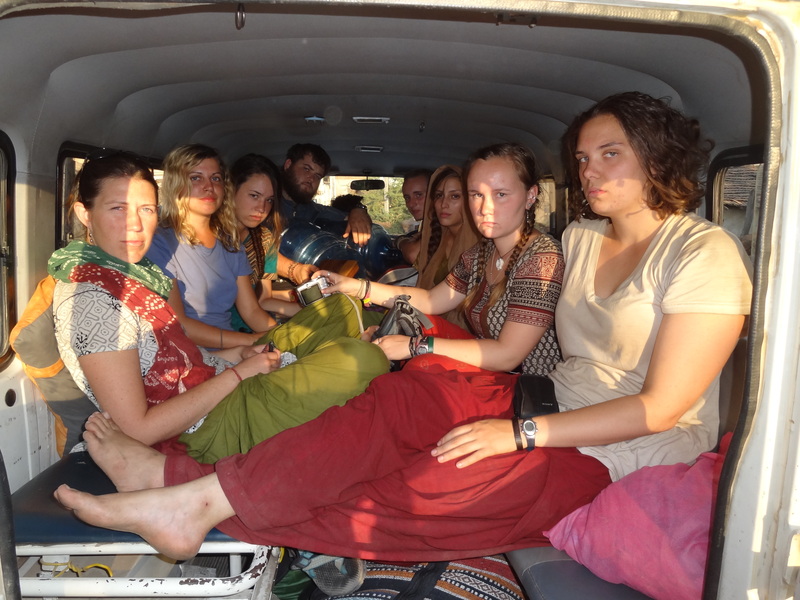 Imagine cramming fifteen people into a small van (it had been an ambulance in a past life), then add all their stuff, two spare tires, and a small tree. (I kid you not. Why the tree was necessary I never did learn, but it was carefully protected the whole trip.) Now, imagine the most pothole-filled road you’ve driven on and combine it with the curviest. To complete the mental picture choose the craziest, stereotypical, Indian driver you can think of. And for fun, we took the scenic route. If you count carefully there are nine of us in the picture, there are still six more waiting to get in. You can clearly see our joy. Once we arrived, we had a full day of a village tours, herb garden health lessons, camel’s milk chai (very very good, for the record), and food so spicy even our Indian friends were sweating. As we were all crawling into our sleeping bags, our village host came to us with one last option for our day. He told us the surrounding villages were gathering one village over for something called a Bhajan, it would begin around 10 o’clock pm and go all night long, and we were invited. Regardless of my friends’ decisions I knew that, as tired as I was, there was no way I would miss this. So in just a few hours, we were off, with our local guides and three members of my travel group. Though I was even less impressed with the driver’s night driving skills, we made it there in one piece, and that is when the magic really began. We parked and climbed out of the van, bleary eyed and wrapped up in our sleeping bags, and made our way towards the music. As we walked toward the house, I knew this was going to be a night to remember, but I had no idea how truly special it would be. We stepped into the house, but it could have very easily been that we had stepped back 10, 50, or even 100 years into the past. The men sat in a circle surrounded by the women and children. Outside the circle of people were many mats, so that people could sing and sleep as they chose. There was an abundance of jaggery (a molasses-like hard candy), chai, and hospitality. And then, there was the music. I’ve tried to think of a way to describe it , but the hand-made lute-like gourd instrument, the cymbals, and the voices combined into something nearly indescribable. On some levels, it wasn’t the most pleasant thing to listen to, but it was captivating. I sat for hours, drinking chai, eating jaggery, and basking in what felt like the most authentic cultural experience I might ever have. Before coming, they had warned us that our Hindi wouldn’t help us, because the villagers only spoke their local dialect; however, around 12:30 am a woman sat down next to me and asked me the first question I learned the answer to in Hindi. “Ap shadi-shuda hai?” Are you married? Between her broken Hindi and mine, we managed a simple conversation. It turns out she was the woman of the house. Though we couldn’t communicate very well, we became friends and she asked me to meet her family. She woke up her four year old son so I could take his picture with his paternal grandmother. I thought that was it, but she asked me to bring my friends, and took us into a back room of her house that was closed off from the general gathering. It was there that I met her mother, and as we sat talking an even older woman walked over to me, tapped me on the shoulder, and told me that she was the mother’s mother. I was blown away. I felt so privileged to meet this family from the youngest to the oldest. We got our translator and sat talking with these women who held together their village through the loss of their sons, husbands and dear friends. They told us of their sorrows, joys, and then they called us their daughters. The strength of these women and the openness of their hearts stirred me to tears. So we sat, no words, just the comforting touch of holding hands. 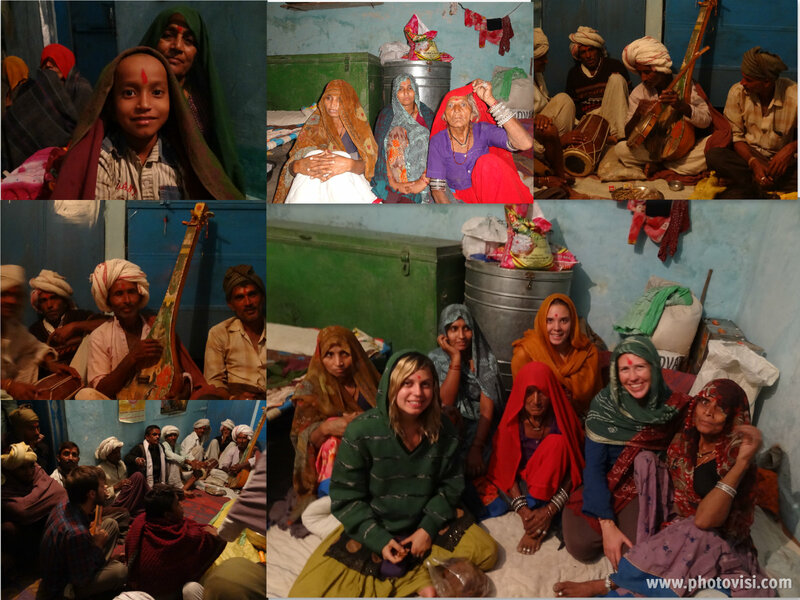 Soon we began to hear the familiar sound of the banjo that our group leader carried around India with us. There really isn’t anything like music to draw drastically different cultures close to each other. I saw men swap instruments and in doing so, sharing a part of their culture so deep it could transcend words. I can’t remember ever feeling so connected to a culture not my own. Love and hospitality can go a long way. I really didn’t want to leave that night. I could have very happily given into the women’s soft pleas of “don’t go” and slept on the mats with the rest of the village, waking and sleeping through the night with the rise and fall of the music. Unfortunately our village hosts decided we needed to get back to our group. The thing is though, it doesn’t matter. What I experienced is something I’ll never forget. I found a family and a home in an Indian village whose name I don’t know. But the thing about the magic of love is that, when its real, it goes deeper than names or whether or not I’ll ever see those women again. In those early morning hours we connected, and I’ll never forget the magic of that. Last year at school I noticed a half eaten apple sitting on the shelf in our common room where we kept the musical instruments. I saw it, thought it was odd and kind of inconsiderate, even took a picture of it, and then walked away. Later, I had a conversation about the oddity of the apple and we wondered who had left it there. It was hours later that I realized that I was part of the problem. 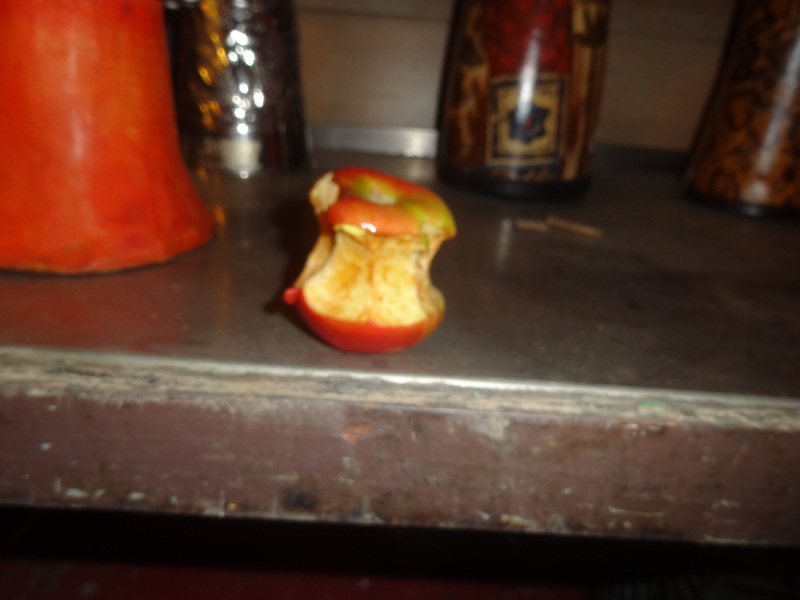 I had seen the problem and not taken any steps towards fixing it, so I went and got the apple and threw it away. Why wasn’t it my first instinct to fix the problem instead of complaining about it? It’s not like the task was incredibly hard. Of course I took a picture instead of fixing the problem. It’s time to be a little more proactive. I’ve noticed something about myself. There are things that I love to do, that I want to, but that I still don’t do. I make excuses and I put it off until I forget why I loved it so much in the first place. I started this blog in Turkey, and while I was traveling it was the easiest thing in the world to find a quiet hour or so to craft what I wanted to say. Once I got home I discovered that everyday life, as unexciting as it might be, has a way of convincing me to be a little more complacent about things. Turning on the TV is easy, surfing the internet is mindless, reading is my mental comfort food and eating is always a good cure for boredom or emotions. Writing, creating, pursuing my goals; that takes effort and drive, and somehow I’d let that fall by the wayside. A few days ago I finally came back here, just to read over what I had written, and the magic of those moments came flooding back to me, along with tons of other ones that I haven’t written yet that I’m dying to get down on paper. I’m not sure why I let this thing that I was filled with so much passion for just sort of float away. I got to thinking, what other things in my life have I cared about that I’ve let fall by the wayside? Relationships? I’m a notoriously bad pen-pal. Health? Other than my fondness for broccoli and brussel sprouts I haven’t done much to take care of myself. What else is there that isn’t even on my radar anymore? A few months ago I made a commitment to begin a daily practice that would last for a year, and I failed. But in that failure came lessons that I needed to learn. So now, I’m making a new commitment. I will do my best. I probably will still zone out sometimes and forget the stuff that’s really important, I’m not perfect. Honestly though, perfect sounds kind of boring, I’d much rather be right here where I am, learning through my imperfections. I’ll readily admit that I am quite the nerd about a lot of things, and a good adventure story is one of those things. One of my favorite things in any adventure story is when the heroes live in, hide in, explore, get lost in, etc., etc, caves. 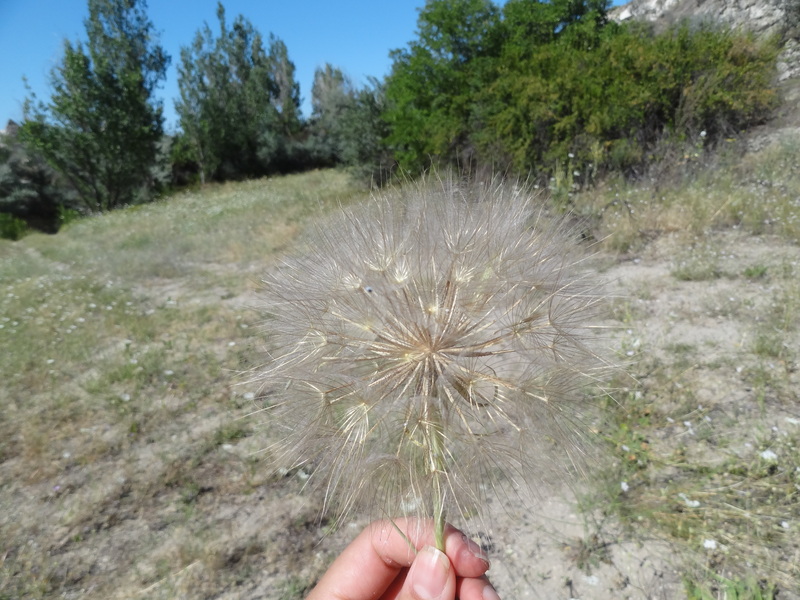 Natural or man-made, it doesn’t really matter, they carry an air of mystery and possibility for me. The few times I have had the chance to go in some of the truly exciting labyrinths I was never satisfied with the safe little tour they took us on. I felt that everything I saw was just a tease. I’ve heard of rock cities that are carved into the side of canyons, like the homes of the Anasazi of the American Southwest, but this was something completely different. The city I went to is just one of the many underground cities in the Cappadocia area, and its called the Mazi Underground City. Its definitely off the beaten tourist path, though that looks like it might be changing soon. 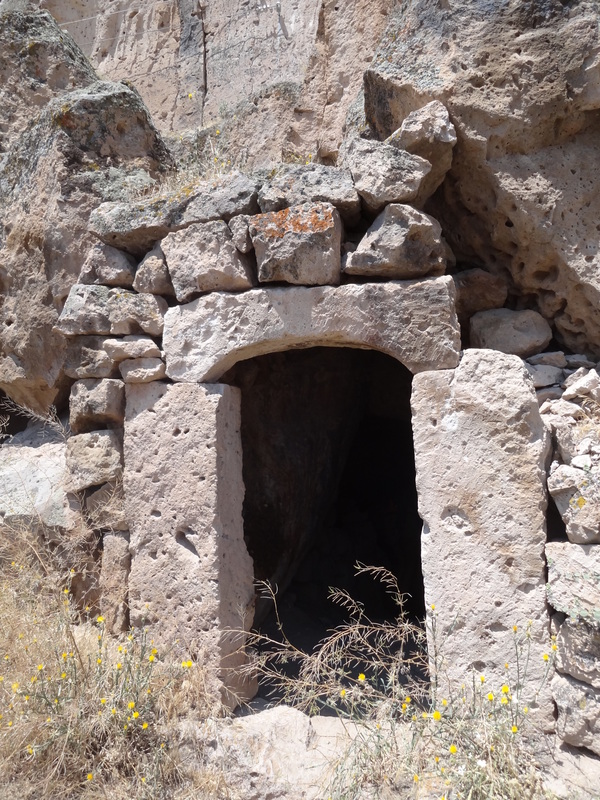 According to our guide, it has been inhabited in some form since the Hittites, who lived there during the 8th century BC, up until approximately 30 years ago. In fact, his own family had inhabited a small part of it. Can’t you just see Indy sprinting out of here? Some of the other people on the tour were a little grumbly because there was no entrance fee and didn’t seem to be anyone around that would indicate that we were in the right place, but I couldn’t have been any more excited. Our guide had grown up exploring the caves, and had a passion for sharing the place with travelers. I knew this was going to be better than I had hoped for, since I was expecting throngs of tourists and guard rails along lit paths. I was right, what I saw blew my mind. The city has underground stables, churches, houses, meeting halls, kitchens, and more. They had small tubes cut in the rock running everywhere for communication, and strategically placed mill-stone doors in case of an outside attack. We walked through tunnels that had once been booby-trapped and experienced the pitch-black of being twelve stories beneath a mountain. Me being me, I took off my shoes and went barefoot throughout the tour as I tried to imagine what day to day life would have been like in this world without sun. I could have very happily explored the place all day, but I can’t say that I was disappointed when we left, given the way we got to go. As a girl I had always wished we had a chimney so I could see what shimmying up one might be like. I no longer have to wonder. This ancient city’s designers built chimney-like ladder shafts throughout the city for quick navigation and communication. Climbing through these barefoot in the dim light of a dying flashlight felt surreal. I felt ancient and modern all at once, and in that moment I remembered why I love adventure so much in the first place. Its about learning things I didn’t know, and learning another way people have gone about, and do go about, this crazy thing called being human. Care to venture into the unknown? So, in case you don’t already know, I’m in Turkey right now, backpacking around for a few weeks before heading back home to figure out what’s next for me. I’m currently in one of the most astonishingly beautiful places I’ve ever been, Cappadocia, the land of fairy chimneys. People have made their homes in the mountains, caves, and rock formations for millennia. Part of the charm of this place for me is that there are so many places to go hiking and all along the path are abandoned cave homes and churches to explore. In the land of fairy chimneys. On my first day here I went exploring. First I hit up the local museum that had all the best preserved examples of churches and dwellings, and I was amazed but not awestruck. When I finished there though, I wasn’t quite ready to head back to my hostel, so I decided to have an adventure. I hiked, climbed, scrambled, and slid around fairy chimneys and caves and prickly shrubs, letting myself have permission to get a little lost. It was then that I found the most magical place of all. I had been clambering into caves for hours and I’d mostly found only disappointingly empty rooms. What possessed me to try this one more cave I don’t know. It looked like it was going to be too dark so see anything and it was going to be tricky to get into. I had to shove away a prickly olive branch and sneak through a weird shaped crevice to get in, but I am so glad I did. 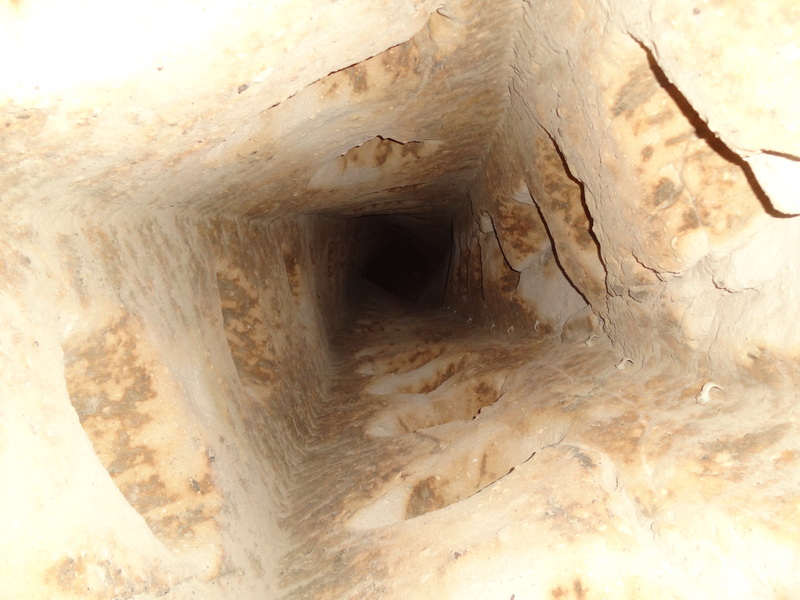 What I found was not just a dark hole or an empty room. It was an ancient chapel, complete with domed ceilings. Time and nature had worn away two of the wall, but mother nature had stepped in to protect this treasure from the elements. I was in a cave church with living walls. I turned around and there was one more surprise waiting for me. 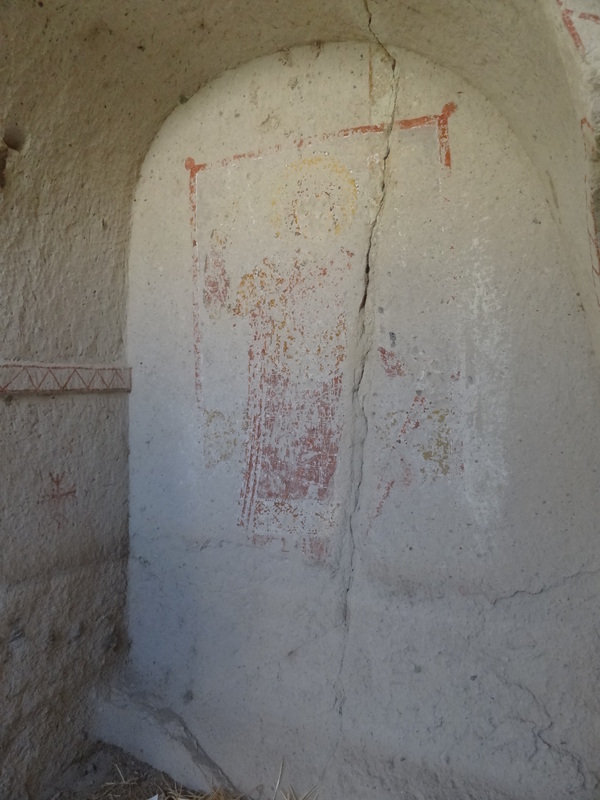 There on the wall was the faint remains of what once must have been a beautiful fresco, fading away from time and memory in this little lost chapel. Someone, hundreds of years ago, lovingly painted that wall, and in that moment I felt more connected to that artist than to any living person on earth. And in that moment a thought popped into my head, and I haven’t been able to get it out since. It goes something like this: I have no idea how far reaching my actions will be, they may very well reach out directly to a person hundreds of years in the future and grab hold of their soul. I guess that means I better live with more than just myself in mind. So I clambered out of my little chapel, pretty much certain that I was inhabiting a different dimension, because I realized that this place outside of time was in sight of the road the whole time. I watched as cars whizzed by and people walked down the street keeping their eyes forward and downcast. The only explanation that made any sense to me is that they must not be occupying the same dimension as me. There I was, a time traveler, witnessing the world I live in in its disconnection. I was reluctant to return to the road, fearing that I too would again tune out to the magic around me but venture back into the 21st century I did. But for a short while I was a time traveler, able to view the world from the outside, and the gift that has given will stay with me, I know it. So I’ve been thinking about this thing that life is full of, magic. Now, I know that everyone has something different come to mind when they see the word magic, you know, like Harry Potter, the slight of hand master at Jimmy’s sixth birthday party, or simply, ‘Magic isn’t real,” but I won’t be talking about that kind of magic. The kind of magic I’m concerned with goes by many different names: synchronicity, the hand of God, destiny, and many more. But whatever you are going to call it, you know what I’m talking about. There are those moments, everyone has had them, where something is more than the sum of its parts and you can feel it — magic. Sometimes I can only notice these in retrospect, sometimes a cherished memory surfaces and once again I can feel the goosebumps rise. The things is, I have a sneaking suspicion that if I were to pay attention, these moments would be a lot more plentiful than I could ever guess. So that’s the mission of this new project: To share my moments of magic with you, both new memories and old. I hope that this encourages you to really look at how special life is. As for me, I will be recording in my journal at least one moment a day for a year. I want to stay in awe of the simple things I often take for granted and embrace my turning points enthusiastically. Maybe you’d like to join me?